In the six years since Apple introduced the modern tablet with the launch of the iPad, the device has occupied an important but unclear role in mCommerce and the associated customer journey. There’s no doubt that tablets are a significant piece of hardware, but being neither as robust as a desktop computer, nor as portable as a smartphone, they sit uncomfortably in the middle of customers’ device roster. With the novelty element of their early years fading, it’s important for retailers to ask themselves: what role does the tablet play in my mCommerce strategy? Current research about tablets’ popularity paints an inconclusive picture. In 2015, the UK telecoms watchdog found that 54 per cent of UK households currently have a tablet device of some description, and they predicted that number would rise throughout 2016. However, sales have slowed during the last 12 months, and because of that, manufacturers are pushing out fewer new models. It’s a vicious cycle: the interest isn’t strong enough to warrant the investment of producing new models, and this means there are no launches to generate interest around, so interest gets even lower. Certainly usage statistics paint an unhealthy picture for tablets. In April 2016, SmartInsights found that tablets are the third most-used device after a desktop and a smartphone. However, while the difference between a desktop and smartphone is relatively small (91% v 80%), the difference between a smartphone and a tablet is much larger (80% v 47%). It’s a question of accessibility. Most people spend their entire day on a computer while at work, and when they’re not at work, they have their phone on them and use that to access the internet. If they have one, people tend to keep tablets at home, where access is limited to weekends and evenings. Yet, just because usage isn’t high doesn’t mean the tablet can’t play a key role in the modern customer journey. While shape and form work against the tablet in some ways, in others they very much work in its favour. Less cumbersome than a desktop, more robust than a mobile, the tablet can be a useful tool for making a purchase while at home in the evening. At this time, customers don’t want to have to get out their laptop, as they’re settled and comfortable, but likewise don’t want to have to cope with the smaller interface of their smartphone where putting in a lot of details is difficult and time-consuming. A tablet is the perfect happy medium. Research supports this idea. 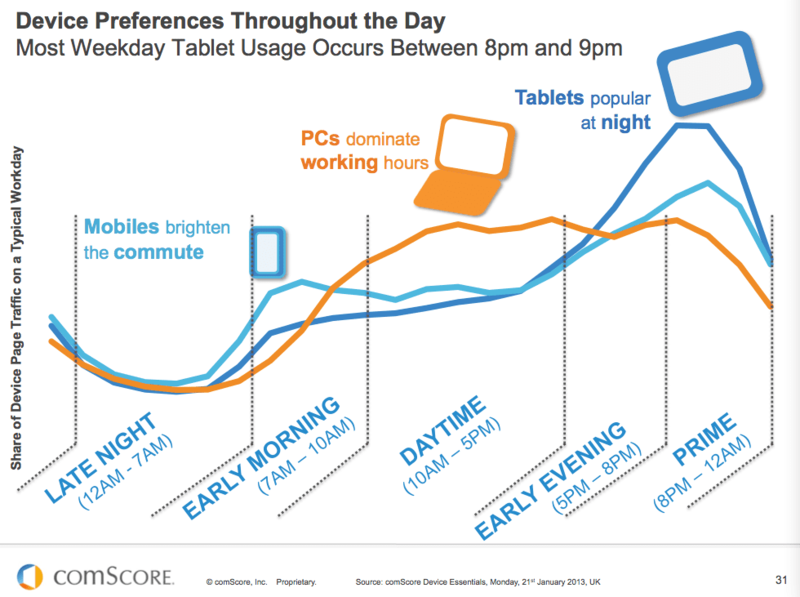 ComScore has found that tablet usage is higher than desktop or smartphone usage at night, meanwhile Montate found that tablets convert higher than smartphones, with tablets globally generating a conversion rate of around 3.5% compared to the circa 1.5% that smartphones tend to generate. This shows that not only do tablets have a place in mCommerce strategies, but that they’re critical tools in converting customers in a multi-device world. In other words, customers may not begin their purchase journey on a tablet, but they’re frequently ending it on one, so it’s important to ensure your mCommerce strategy is as adaptive as your customers’ habits are. Of course, no two sites and no two sets of customers are the same. So retailers should look at how their customers are using their site to understand just how big a role tablets are playing and adjust their user experience accordingly. Because while tablets are undoubtedly not the force they were in the years immediately after their launch, they are still playing a critical role, and there’s still ample opportunity for brands to take advantage of that. What do you think of the role of the tablet in the modern customer journey? Are you finding that tablets still play a major role? Let us know in the comments section or get in touch via social media.